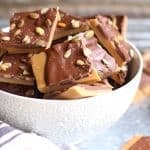 My Easy Homemade Toffee recipe is brought to you from Norma Jean, aka my mom – who now suffers from Alzheimer’s and is unable to work her craft – cooking and baking. She was a natural in the kitchen, and baking was her specialty, as you can see from her collection of recipes on here – Norma Jean’s Kitchen. I’m so proud to be able to re-create some of her dishes, and preserve them for the foreseeable future. I hope I’m doing them justice.
. I didn’t have one, so I bought one on Amazon after reading reviews. There are SO many kinds, but so far so good. 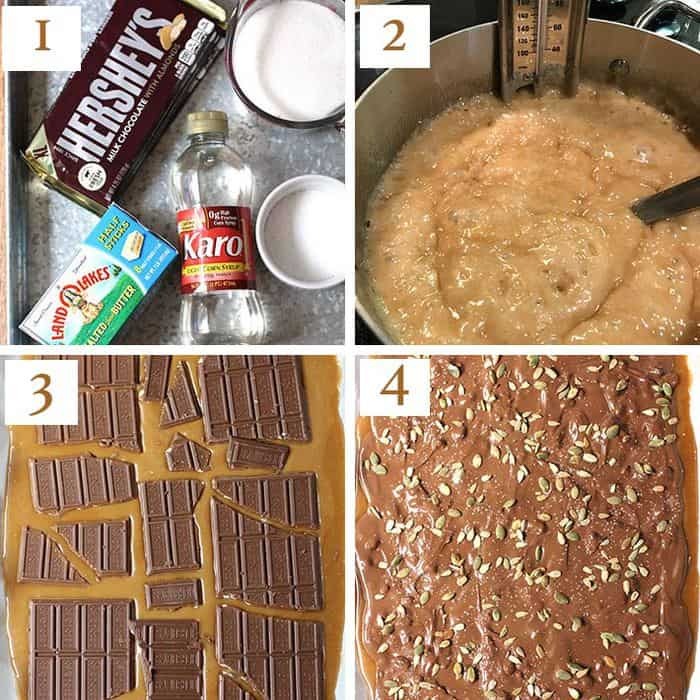 I suppose you COULD try to make my Easy Homemade Toffee without the candy thermometer, but it would be a guessing game, and why not be sure? The good news is that you’ve got my tips, and I’m going to prevent you from making the mistakes I made during my first attempt. 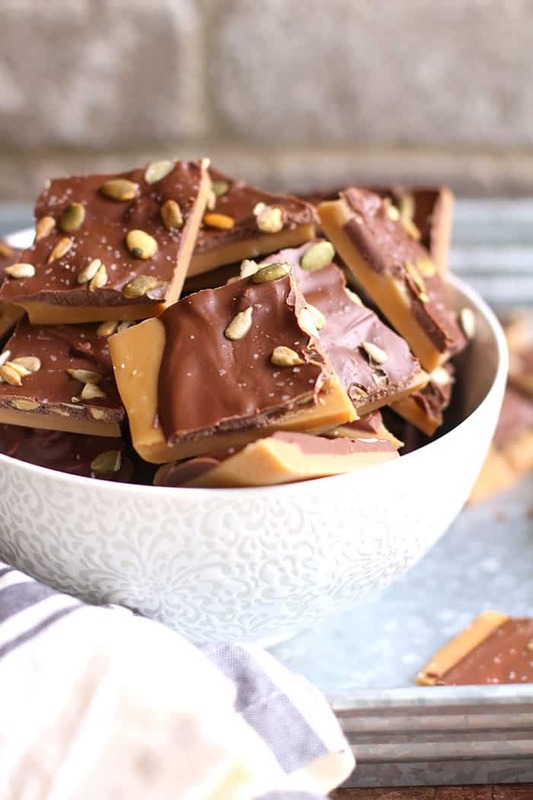 Tips for making the most EPIC toffee. When the butter is melted, add the sugar, salt, syrup, and water. Cook on medium high until the candy thermometer reaches 305 degrees. Be patient while the toffee mixture cooks. It will take approximately 15 – 20 minutes for it to reach the desired temperature. Stir VERY frequently, watching the candy thermometer as it climbs. Don’t be tempted to turn the heat up over medium high heat. Be patient. Watch the thermometer very close, and pull the pan off the heat immediately as it reaches 305 degrees. Immediately pour the toffee mixture into a prepared baking sheet (lined with parchment paper). Lay the chocolate bars on top, spread it around evenly, and top with nuts of your choice (or none at all). The picture of my All-Clad pan on the left is after I soaked it, scrubbed it, Mike soaked it and scrubbed it, and REPEAT. I finally googled “how to get stubborn burns off of All-Clad pans”, and my answer popped up. Jessica Gavin, an awesome food blogger and culinary scientist, wrote a blog post about this very topic. Then I let it cool, and scrubbed. I repeated this process for at least five times. And was FINALLY able to get almost every speck off of the bottom of the pan. Thank you Jessica! I’ve got a confession to make. It’s mid-November (as I’m writing this) and I’m listening to Christmas music on Spotify. Sorry (not sorry)! 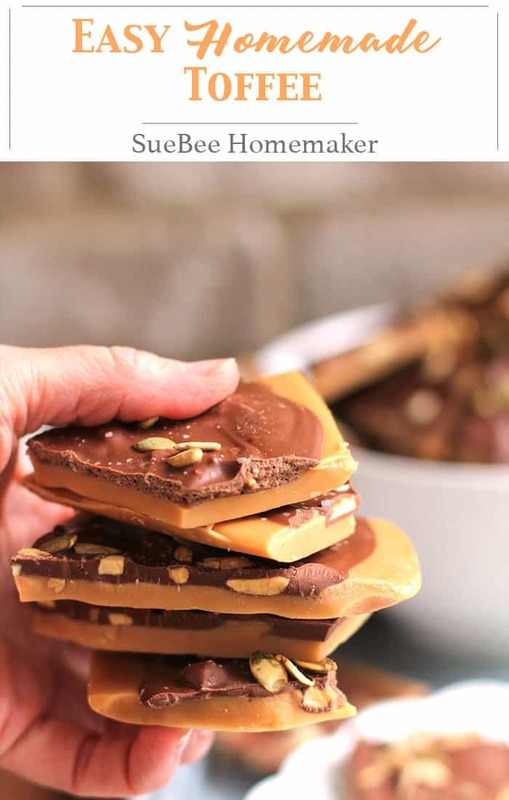 I decided if I’m I’m going to make Christmas treats (like this Easy Homemade Toffee) for SueBee Homemaker, then I’m going to go all in. That means I’m listening to Mannheim Steamroller, Amy Grant, Sarah Mclachlan, Amy Grant, Kelly Clarkson, Pentatonix, Michael Buble, and a slew of others – all while baking, photographing, blogging, and doing dishes. Easy Homemade Toffee is the ultimate holiday treat and reminds me of my mom, who used to make this every year. Only eight ingredients, a little finesse, and some patience is all it takes! Melt the butter in a medium pan. Add the sugar, syrup, water and salt and turn heat to medium high. Bring to a boil, stirring constantly, and then continue cooking over medium high heat until it becomes an almond color and the candy thermometer reaches 305 degrees. This process should take approximately 15 - 20 minutes. Be careful, because it is VERY easy to burn. Pour mixture in prepared baking sheet, and even it out with a spoon. Lay four large Hershey's candy bars on top. Wait a minute and then as the chocolate melts, spread it around evenly with a spoon. Top with some additional nuts (any kind you like or none at all) and a sprinkle of kosher salt. Place in freezer for approximately 45 minutes. 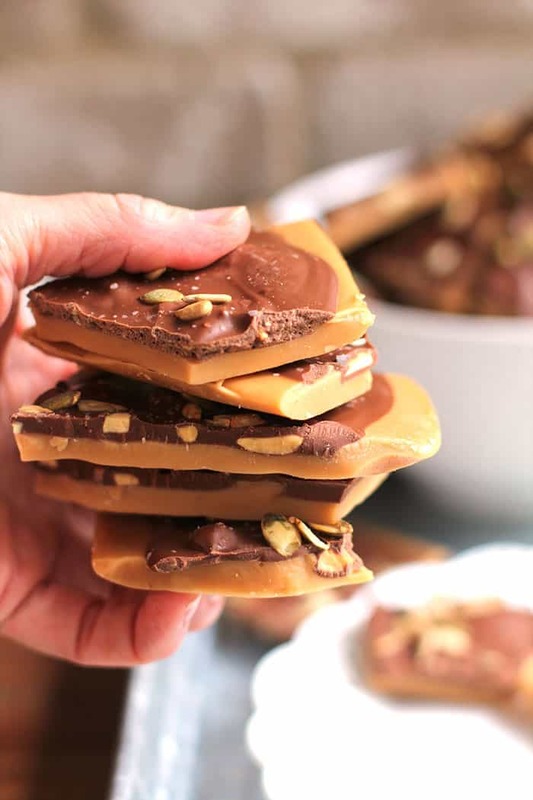 Remove from freezer and break the toffee apart with your hands. Store in airtight container. Make sure you use a candy thermometer, and clip it on to the pan, so that it does NOT touch the bottom of the pan. Be patient as the mixture cooks, and don't turn the heat up over medium high (to avoid burning). The toffee mixture is done at 305 degrees. This toffee freezes well for several months. What is the white syrup you used? Homemade or store bought? Light kayro? I’m excited to try this! Yes, Karo syrup, like in the picture above! Enjoy!! YUM! These look absolutely delicious and so easy to make! Norma Jean rocked this recipe and it was not an official Christmas season until I had a helping or 2! If you are having a party or a family gathering, this will be a hit and everyone will be impressed. Suggestion – Reread tip #1 from above. Especially, if you are on dish patrol or the clean-up crew!